By LUDWIG VON KOOPA - To this day. Some people have accused me over the years of being a hipster. I completely reject this label, and I'd be a pretty terrible hipster when my favourite companies and preferences are... actually pretty mainstream! You know, Nintendo. Do you think that's relegated to hipsterville? I don't! That said, one thing I can't shake off is my idea that cartridges are better than disks or cards. You know, the ones we had for the Nintendo 64, SNES, and the Game Boy Advance, among other pre-GameCube products. Since that time, your game files were saved off the cartridge and onto... memory cards, external hard-drives, and internal flash memory. This may be the storage medium for my favourite console, but it's also the beginning of the end. Again, I've been thinking this since 2003 when I got my GameCube. And I'm reminded of it just recently. “Um... I was... playing For Glory teams... and after Sudden Death, it said my SD Card was removed and to go to Home. No one was actually helpful, by the way. But basically, during that time, the Nintendo Network went under unannounced maintenance, so I was booted off For Glory Teams of Super Smash Bros. For 3DS. Well, okay, my partner was a LOSER Charizard who kept spamming Flare Blitz. I didn't want to stay anyway! But the boot message was that my SD card is no longer in the system? How is that possible?! It's clearly still in there! It's a locked room murder! I went to the 3DS's Data Management, and to my horror, it said my SD card was corrupted and needed to be formatted. Naturally, this would mean all my data would be erased. No! You can't do that! I 101%-ed Kid Icarus: Uprising! That's an accomplishment worth keeping and gloating about! So I turned off the system, took out the SD card (kind of struggling to do so... it's hard to get out!) and... blew on it. And the slot. You know, like it was an NES cartridge. So my files were still functional when I went to play with them. So much for corrupted, right? It was just a scare. That said, as of publishing, I still haven't looked at Data Management again. I narrowly escaped the first time, no telling what might happen the next! Anyway, apparently the maintenance for the online service somehow tricked my 3DS into thinking my SD card no longer works. That doesn't even make SENSE. And it's that nonsensical trait that makes me believe cartridges are superior. With your memory saved in several different places and not one place, your property ends up safer. If one ship is sunk, you still got other ships! But if central command is nuked, then you're doomed. Who knows what weird incident will result in my internally saved data to be wiped off the planet? Some terrorist could get it removed all in one fell sweep! I was this close to it happening to me. If one game is down, I can still play others. Think I'm just talking out of my shell? It could happen to anyone, even Masahiro Sakurai. He lost 18 years worth of game saves when his Sony PlayStation 3's hard drive crashed! Which would not have happened if it wasn't saved only in one place. Your games are not connected to your console. Your game saves are connected to your physical cartridge, and can be used with a replacement hardware without any hassle. That's how it used to be. Now companies like Electronic Arts are trying to kill physical distribution altogether. It is only making things more and more dangerous and restrictive. You know what digital-only means? The control for your games is on their servers. Cartridges mean flexibility and freedom. And that's why I like them more. Is Ludwig a complete old fogey, or do you actually agree with the guy? 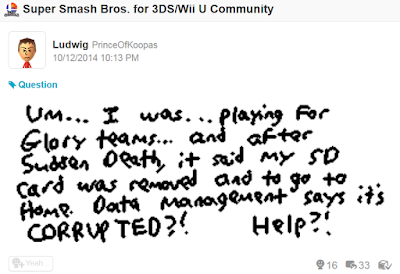 Give your feedback here, and be more helpful on Miiverse! 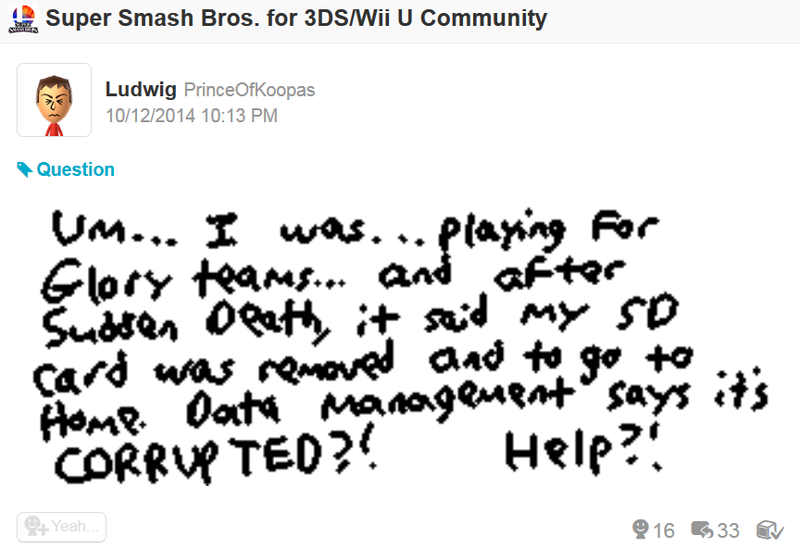 You can start by Following Ludwig at NNID PrinceOfKoopas. I'm conflicted on this. I do often worry that if something happens to my hard drive/memory card/whatever, I'd lose all my game data. On the other hand, I like knowing that if, say, my Silent Hill 4 disk breaks, I could get a new one and still start up my old saved games. Sure, if your disk snaps in half, then it's useful. ...Now try to snap your N64 cartridge in half. Yes, well... that would be difficult. XD But cartridges can still wear out over long periods of time, and the old Gameboy line eventually lose their internal memory. Yeah, that sort of thing tragically happened to Pokémon Gold/Silver/Crystal, which is why their remakes were necessary. GBA cartridges are still going strong though. Even if your GB or NES games stop saving, you can just pop it open and replace the button cell battery. ive had to do that with some of my cartridge games, and they all work like champs again. A lot of people would be very intimidated by the technical skills needed to do that, though. Update: Checked my Data Management. It's not corrupted.